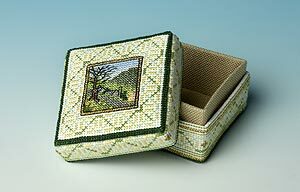 This box shows the dale just starting to put out the green shoots of spring. Daffodils and early blossom add colour to gardens and hedgerows. Green is the predominant colour with a dark green base and a light gold lining.